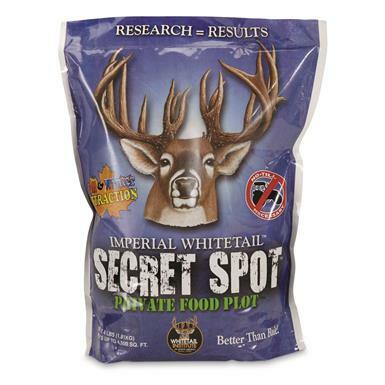 Whitetail Institute Imperial Secret Spot, 4-lbs. Have your deer herd of this Secret Spot? Plant Whitetail Institute Imperial Secret SpotTM Annual Seed when you want to attract deer - and only deer - to your favorite hunting ground. This combination contains up to 12 annual forages designed to one-up nature by providing a constantly renewing feast for whitetails from early summer through late fall. Preparation is minimal, simply clear the ground of existing vegetation, expose enough to establish seed to soil contact and spread out this 4 lb. bag to cover approximately 1/8 acre. Secret Spot works well in small openings in the woods or high ground in swampy areas where sunlight reaches the ground. It contains a soil pH booster to help forage growth even in slightly acidic ground and germinates in less than one week! Antler King Plot Max, 32 oz. Each pack plants 500 sq. ft.
Everything you need to attract deer to your plot. Helps your food plot stay viable in the worst of conditions!